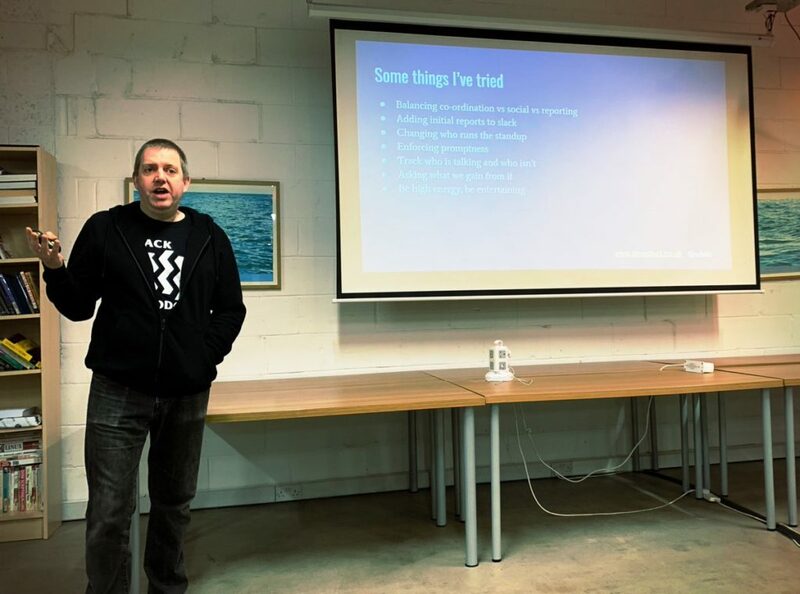 I spoke at Brighton Lean Agile last week, stepping in at short notice to cover for a friend. The event was great fun and I enjoyed the discussions I had with everyone. Rather than share the slides, I thought I’d do a quick blog post, allowing me to add some context to the bullet points. The talk discussed how agile doesn’t always work, and what can be done about it. While I might sound cynical about agile in what follows, I still believe in it. I think that the principles it promotes, such as regular reviews, tailoring methods to the team etc. are incredibly important. At the same time, a good waterfall project beats a bad agile one. While agile is detailed and subtle, there are core principles that are easily applied. It is flexible – there are accounts of it being applied to many industries and sizes of team. And it is popular – a large number of people have experience of it. However, most companies face problems with the implementation, and even fundamental aspects. Every IT job ad I see these days has agile as a requirement. But listing something in a set of job requirements is not the same as understanding or implementing it. Most of the points above are self-explanatory. I think it’s important to look at what an organisation needs from the daily meeting, and to focus on providing that without distraction or fluff (for example, if you do need people to report to management, find a more effective way to do that). The energy is also important – attendees need to think about their contribution and how to make it effective. In the discussion we talked a little about how teams refusing to give estimates is usually a symptom of a larger problem. Another issue is estimates as negotiation rather than a best-effort prediction (ie padding for safety). Punishment for failing to hit previous estimates often leads to this sort of padding. I concluded this section by saying that estimation sessions were something I often wished to cancel, possibly in favour of the person who was most informed/influential doing the estimates themselves. One participant said they had abandoned estimates in favour or sizing stories in a predictable manner. One important thing to consider is whether the information in the estimates will change anything. If not (for example, schedule and scope are already set) then there may be little point spending time working out how long something will actually take. The project is scheduled with no slack for developers being called away by emergencies. An example of this is ‘schedule compression’ – the deadline doesn’t move, but everyone resolves to try harder and be more efficient. I made two suggestions – the first was a reference to Sturgeon’s Law, which claims that “90% of everything is crap”. Maybe agile is difficult, everyone is doing their best, and we just have to be happy that things are working better than they would without agile. My other suggestion was looking at cargo cults. This is a pejorative term in agile, but this betrays a lack of sympathy/understanding of the actual cargo cults. Cargo cults were seen on a number of Polynesian islands, particularly after world war 2, where the residents of those islands built planes and airstrips from local materials, supposedly in the hope of cargo planes landing on the island. It’s given as an example of people imitating something without understanding the principles. However, this idea that cargo cults are foolish is a racist and limited one. Indeed, the idea that they are about the arrival of cargo and that people actually expect planes to land are probably misapprehensions. For those involved, there are other reasons for setting out these airstrips. Western anthropologists have potentially had a blind-spot in their own obsession with monetary goods and missed these deeper motives. In fact, these cargo cults are a success, if you understand why they have been set up. They are also effective simply on the terms for which they have mocked, since the cults have brought anthropologists and TV documentary crews to the islands in question. But to see why they succeed, you need to have sympathy/empathy with why cargo cults exist. A lot of agile implementations seem to feature a sort of sabotage, where people involved do things that are directly against their best interests. I closed by suggesting that, when an organisation is doing things that are obviously wrong and harmful to agile, there is often a deeper, more compelling system in place. This then formed the basis of a final discussion section. tldr; building a webapp is complicated – particularly if you’re doing it right. JHipster offers a promising solution. I was a little shocked recently when I realised that I didn’t know how to make a web-application. It’s not like I’m inexperienced. I’ve been working on the web since 2000; but my job involves focussing on specific areas. Even when helping with strategy, I have very little input into the front-end. Being responsible for an application going live and doing it all myself are very different things. Coupling the templates to the server-side code misses the separation of architectures like REST. Adding, say, a mobile client would involve a lot of hassle to get the two different front ends working. More modern architectures are available for front-end. Using REST and angular allows rapid development of flexible front ends, less coupled to the backend architecture. Another question that arose was user management and security. This is one of those things that every site needs, but tends to be tedious to code (as well as inviting errors). Any decent user management system needs account creation, password resetting, different roles etc. For most projects, these are going to be the same. My basic assumption would be that Spring security would be useful for that, but that is really a framework for creating a security framework, and there are no obvious mature implementations. Setting up email account confirmation is a drag. I weighed up a few options for authentication, particularly since I wanted one that supported a stateless web-server. After speaking to a friend, JWT seemed to be the way to go, but this still seemed like a lot of work. And I’d not even started grappling with the whole front-end stack. I started working in a new office recently and a colleague suggested JHipster as a solution to my problems. I’d heard about the technology via InfoQ but hadn’t paid it a lot of attention. Part of this was the name, which sounded insincere and jokey. And my cursory look suggested it was ‘just’ angular with spring boot. I’d missed something very interesting. 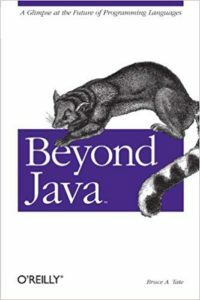 According to the JHipster mini-book, JHipster allows Java devs to “be hip again”. The knowing irony of the framework’s name is irritating, but this idea of being ‘hip’ is good. Web development has changed a great deal, and JHipster provides a simple way to get started with up-to-date technologies, combining bootstrap, angular (or react) and Spring boot. The project started back in October 2013, with the first release in December of that year. The best way to get a flavour of how JHipster works it to look at Matt Raible’s 16-minute demo of building a blog application, get started with JHipster 5. Full-stack development is hard work, even with JHipster – you need to be familiar with both Spring and angular. But this does put you a lot closer than ever before to putting live a full-stack application using best of breed technology. Due to a last-minute drop-out, I’m speaking at Brighton Lean Agile on January 9th. The title of the talk is “We’re agile, but…” and looks at some of the ways I’ve seen agile going astray in implementations. Despite the simplicity and popularity of Agile, it often goes wrong in practise. Drawing on 15 years’ experience of Agile as developer and PM, James Burt will lead a discussion on why agile sometimes fails, and what can be done about it. The session is currently full but there is a waiting list, as people sometimes drop out as the event approaches. Refreshments are provided by the sponsor, Bright Interactive. In the long term, I want to get back into full-stack development; but in the short term, I just want to put a mapping site live. I’ve settled on JHipster as a platform, since it makes managing the database and middle-tier incredible easy, as well as setting up a lot of the Angular infrastructure. The problem is that almost all the Openlayers examples that I can find are written with JQuery. I found a few clues on what to do, such as a Stackoverflow post on How do I dynamically add popups to markers using OpenLayers 5 in Angular 4?, but my meagre experience of Angular meant I couldn’t get the Popper library this used to work. But the answer gave me enough of a clue to get the syntax and code set up for a very basic implementation of Openlayers popups within angular. The work is in done within the controller, and builds and executes correctly. It’s far from perfect – because the component is embedded within another page, the pop-up doesn’t appear with the feature, rather it is placed a short distance above. There is also a problem with the click detection being flakey – the window has to be resized for this to work reliably. But the good thing is, I now have a proof of concept for Openlayers working within JHipster. As scrappy as this is, I do seem to have them working together now. It’s going to be ugly, but I have enough to build a basic application with. I spent a chunk of this weekend wrestling with writing software. Which was a good way to relax after a late night dancing at Is that all there is to a Disco? Saturday was a slow day: writing code, watching Escape Plan 2 with Rosy Carrick (not a good film) and getting to grips with Openlayers. But I managed to beat it all into submission and produce a working demo. 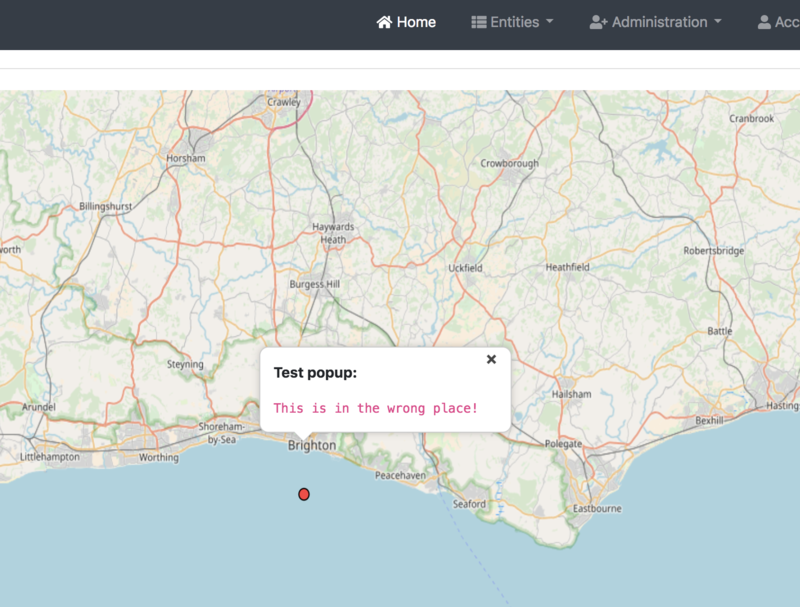 I wanted to load some data from GeoJSON and display location markers on an Openstreetmap map. It’s not very much, but it is something I can later add to a larger project. This creates a map object and sets it into the map object. A single layer is set up with OSM (openstreetmap) as the source. The view allows the map’s centre, resolution and rotation to be set. Note that zoom level 0 is zoomed out fully. Tile – Renders sources that provide tiled images in grids that are organized by zoom levels for specific resolutions. Image – Renders sources that provide map images at arbitrary extents and resolutions. Vector – Renders vector data client-side. VectorTile – Renders data that is provided as vector tiles. The center of the view is set using a conversion from longitude and latitude. This is one of the confusions with open streetmap. It uses a co-ordinate system called Spherical Mercator projection (known as EPSG:3857), and the usual longitude/latitude co-ordinates are held in a projection called EPSG:4326. The next stage was finding a way to add markers to the map. A lot of the examples for this were using different versions of Openlayers. The one that I ended up adapting was a recent tutorial on mediarealm. We create a new vectorlayer which contains another vector with all of the features. This could then display markers with a small red dot. Once loaded, this feature array can then be dropped easily into a vector layer and added to the map. The source of the placedata array can be changed – I started out with a hardcoded version, and then added in one from a REST endpoint. I created a quick REST server using the Spring Boot REST example as a basis, and changing it to return place data. Loading the data from GeoJSON turned out to be the fiddliest part of this because of the conversions between different projections. The last thing I wanted to do was add pop-ups to the markers. There was an example of this in the Openlayers workshop. The way this works is simple – an onClick event for the map is added, checking whether there is a feature at the point in question. There’s a lot of code to the example, but it was easy enough to amend and get working. It took a little longer than planned, but I managed to set up a simple HTML page that displayed openstreetmaps tiles, with markers provided by a REST endpoint. It’s been a while since my last post here! Most of 2017 was taken up project managing a massive mobile project across ten countries – which came in on time and on budget. 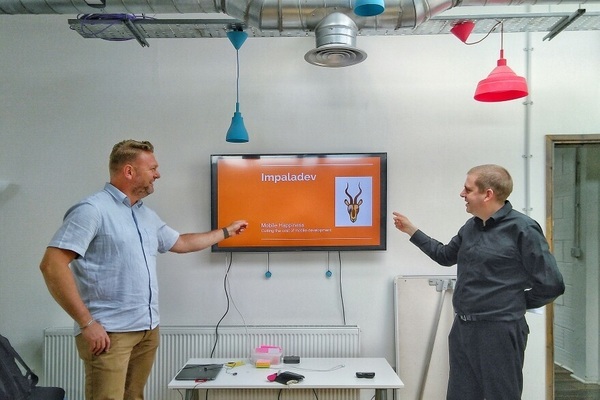 More recently, I’ve started a new company called Impaladev with Brad Legge, providing managed mobile and Java development teams. As part of this, we’ve set up a workshop on Mobile Happiness. This condenses all the things we’ve learned about mobile delivery into a single hour (although many of the points are relevant to web and desktop applications). And we reveal the innermost secret of Project Management. We ran a test of the workshop last night for a variety of ex-colleagues and it went very well – not least because we finished in time for that evening’s football match. Everyone came out of the workshop activities with new ideas for shaking up there projects. We’re now looking for new venues and audiences for the talk. If your group or company might be interested, get in touch! Below is the obligatory corporate pointing-at-a-screen photo.